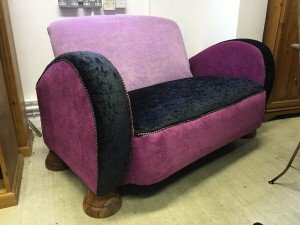 A retro style two seater salon sofa chair, upholstered in purple and black velour with brass stud detailing. 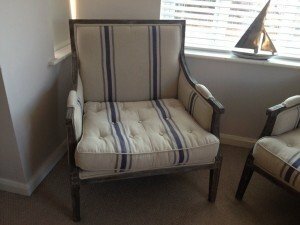 A pair of modern unique square backed armchairs, upholstered in nautical blue and cream striped fabric with button detailing. 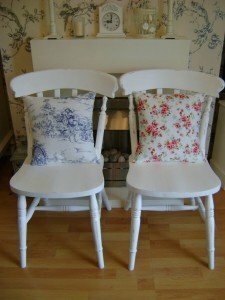 A pair of cream hand painted rounded back dining chairs in the shabby chic style, together with two patterned throw cushions. 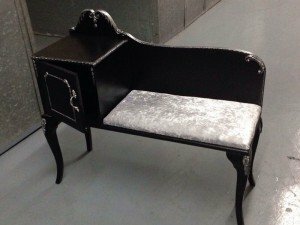 A hand painted gloss black, solid wood French style chaise lounge telephone table, with small storing cupboard attached, upholstered in metallic silver velour. 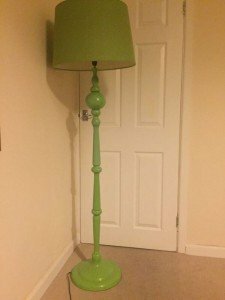 A tall standing green painted metal floor lamp on a circular base, with matching darker green lampshade. 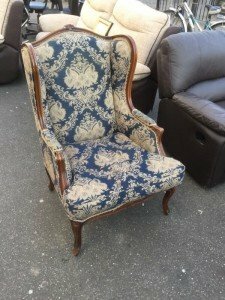 A French armchair on a carved solid wooden base, upholstered in blue and cream patterned printed fabric. 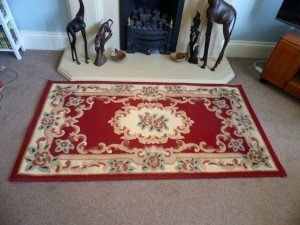 A small oriental style floor rug, decorated with a floral border against a deep red ground. 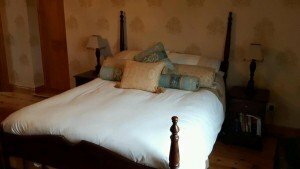 A mahogany four poster double bed and mattress, together with two matching three drawer bedside tables and lamps. 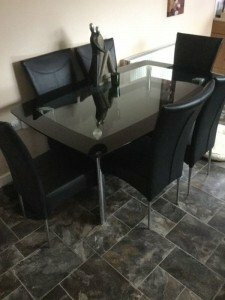 A black and chrome glass topped dining table, together with six high back dining chairs upholstered in black faux leather. 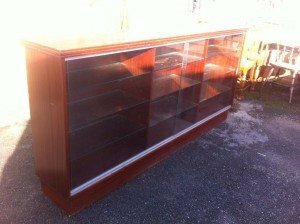 A large mahogany side board unit with inner fitted lights, sliding glass doors and nine removable glass shelves. 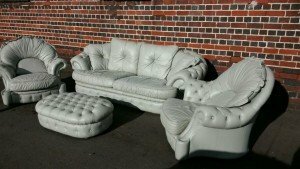 A four piece Pendragon sofa suite, comprising of a large two seater sofa, an oval shaped storage foot stool and two matching armchairs, all upholstered in grey leather with button detailing. 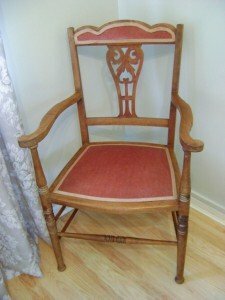 A carved solid wood open back hall chair, inlaid with terracotta cotton fabric to the seat and back rest. 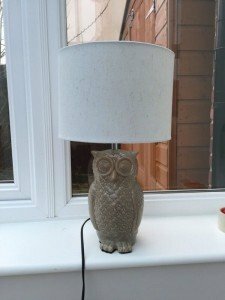 A rustic effect shabby chic ceramic table lamp designed as an owl, with a white lampshade. 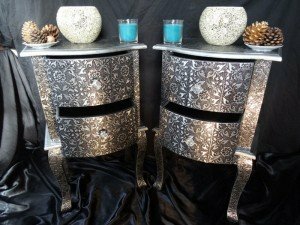 A matching pair of vintage serpentine two drawer bedside tables in the French Rococo style. 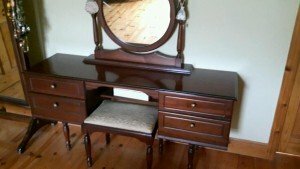 A mahogany four drawer dressing table and removable swing mirror, together with matching square stool, upholstered in damask champagne velour. 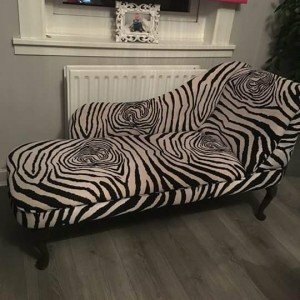 A large modern chaise lounge sofa, on a black wooden base and upholstered in zebra printed velour. 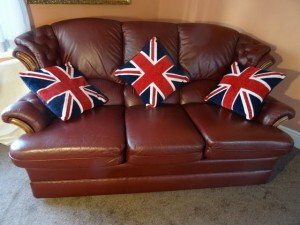 An Art Deco Chesterfield three seater high back sofa, upholstered in oxblood red authentic leather, together with three Union Jack sofa cushions. 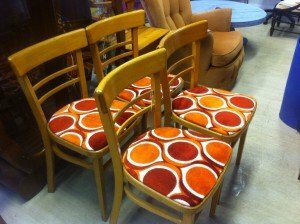 A set of four 1950’s style retro dining chairs, painted in mustard yellow with orange patterned upholstery. 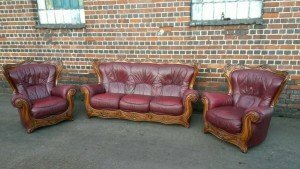 A three piece vintage sofa suite, comprising of a three seater high back sofa and two matching armchairs, all on heavily carved solid wood bases and upholstered in deep red authentic leather.